Flee continental Europe with not just Nazi hordes but even nastier monsters after you. 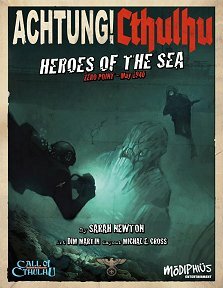 Publisher's blurb: "Heroes of the Sea is the second standalone adventure supplement in the globe-spanning Zero Point campaign. Play soldiers, agents, and resistance fighters in the chaos and carnage of the Battle of Dunkirk, as a sinister conspiracy threatens the lives of the retreating Allied forces!"